BANGI, 11 September 2014 – Traditional Malay literature which nurtures character building and upholds importance of society over self has been dispossessed and lost due to the sinister machinations of the colonial powers. This is the findings of a Malay literary expert from the Institute of Malay World and Civilisation (ATMA) of The National University of Malaysia, Prof Noriah Taslim. In a public lecture at ATMA here today Prof Noriah reveals the hidden agenda of the British to kill traditional Malay literature and how it was carried out brilliantly using local collaborators. These collaborators, she said, are until today still hailed as respected figures in Malay Literature even though they were unintentionally responsible for the death of Malay literature. She focuses on how the traditional literature, was phased out by the British during the 18th and 19th century. Prof Noriah said this done deliberately to create a generation that idolises the West with the aim of uprooting them from their own true identity connected to a rich historical culture. The result is that the west is now idolised for its ability to dominate half of the world and with the east living with a constant chip on their shoulders because they were once colonised. She said the effort was made through using British and western scholars to ridicule Malay traditional literature as lacking in substance and were mere fairy tales. Malay traditional literature which flourishes after the arrival of Islam was criticised as not fit to be accorded as works of literary art. The Malays would thus be embarrassed and try to distance themselves from their own literature resulting in the stagnation of traditional literature, Prof Noriah said. Western literary figure then mentored local writers to idolise the colonial powers. She gave the example of Thomson North, Keasberry and Stamford Raffles with Abdullah Munsyi, Robert Scott with Ahmad Rijaludin dan Butter Hunnings with Lau’din. Thus the traditional Malay literature which promotes the Malay nature of being good hearted, independent, courteous, loving, upholding justice and tolerance as well as friendliness is replaced with a genre that idolises the Europeans and European narration which is based on self instead of the community. The final nail in the coffin is when the Jawi script used in Malay writings was discarded in favour of the Romanised script. Their argument was that the Jawi script was defective because it lacks vowels. The hidden agenda was to undermine the Malays with their Islamic identity which is a source of their strength, Prof Noriah said. Eliminating the Jawi script, removes the strong bond between the Malay identity with Islam and their connection to the Islamic world. 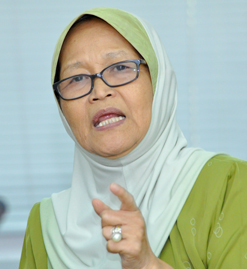 She contended that even relationships between the Malays and the Arabs are not spared. Writings which incite Malays not to sit or listen to Arabs such as Hikayat Hikamat and Hikayat Kapal Asap were promoted. Ironically, the traditional manuscripts of Malay literature which was ridiculed by them, is collected, looted and taken back to England in shiploads. Such is the situation that anyone here who wants to study traditional Malay literature have to travel to the Public Records Office in Kew Gardens London. Present at the talk were the Principal Research Fellows of ATMA, Prof Dato’ Zawiyah Baba and Prof Ding Choo Ming. Prof Ding when asked for his reaction said we are still being colonised until today. Researchers still needed to publish their research findings in Scorpus and ISI Journals to be recognised even by their own universities. He said two decades ago there were about 200 local journals published but due to their mental colonisations, the 200 journals are gone with only a few that can be counted on the fingers remaining. Revisiting past stories in the UKM News Portal, it began with a story on Aljazari, a Muslim inventor in the 12th century who predates Leornado Da Vinci by more than 200 years but is unfortunately not generally known. He came up a system of gears and pulleys using hydro power to distribute water from a river to a township up on a hill in Turkey at a time when electricity was still not known. He did not publish his system in any journal article in publications like Scorpus or ISI and thus do not have a single patent to his name. Yet his discovery benefited the people to this day.